Local folklore has many stories loaded with ancient mythology. One such example is the “One-Eyed Hare of Loughanleagh”. 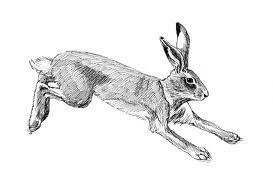 It is said that a gamekeeper lived on the mountain and had been told that a fine hare had been seen beside the “Lake of the Cure”, so he concealed himself nearby to kill it. One day, just as the sun was sinking beneath the horizon a hare came abounding to him. But what he saw astounded him and he could not move. The hare was no ordinary hare – it had a great big red eye in the centre of its forehead and dived right down into the lake to the “Otherworld” where it belonged. The lake was therefore a sacred entrance to the “Otherworld” where the ancient Gods and heroes dwelt and feasted. In pagan times they offered sacrifices to their gods by throwing valuable objects into deep water. Hoards of gold and bronze have been discovered in bogs and lakes on the continent and in Britain where they were deposited thousands of years ago to please their gods. Some of our Irish lakes and bogs may have similar treasures but so far no treasure has been unearthed here. It was an ancient goddess of the Irish known in tradition as the CAILLEACH who dropped stones out of her apron to form the cairns on the SLIABH NA CAILLIGHE hills in Meath and on Loughanleagh mountain. Sometimes she appeared very ugly but when she chose she could be young and beautiful. 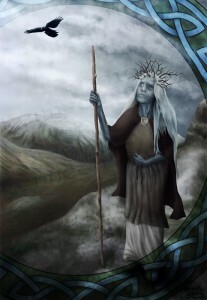 There was according to the old folk a dramatic confrontation between the CAILLEACH representing the old faith and Saint Patrick representing the new faith, in the hollow in the Tiervurcher road east of the ancient church of Moybolgue. Legend has used a language of its own to describe the event which we may not take as the literal truth. It tells how a beautiful lady was riding to Mass being celebrated by St. Patrick. It may be significant that the Cailleach was coming from the direction of the ancient stone Age Court Cairn of Carnaville. As she passed some blackberries she disregarded her intentions and ate them. Instantly she was transformed into a ferocious monster, which swallowed the horse and horse-boy. Then she started to devour the people. Going down on one knee, Patrick with his staff (one version of the legend says with an arrow) struck her and she was blown to pieces. A cairn on the roadside marks the site of her grave of which only a few large stones remain in the ditch. It used to be feared that the monster would rise again and continue her work of destruction. Children used to pass the ‘Tory Bush’ on the north side of the mountain in fear and trembling for that was one of the places from which it was believed she would emerge some day to destroy the country.